For nonprofits leadership transitions are a time of exceptionally high risk. Here, three internationally-respected experts show how to systematically identify, introduce, support, and monitor leaders in ways that enhance rather than undermine their performance. 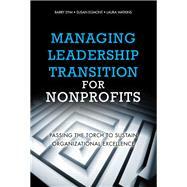 They explain why leadership transitions are so challenging for nonprofits, and show how to replace chaos and crisis with proven, sustainable leadership transition plans.